Smaller, easier to use and completely devoid of a disc drive of any sort, the PSPgo is powered only by digital media, a brave step into the future of gaming. But is it a future in which we want to live? Pure Digital: The PSPgo is smaller, sleeker, better designed than its predecessors, but the thing that really separates it from all of the Playstation Portables that came before is its lack of a Universal Media Disc drive. Gamers will rely almost entirely on a WiFi connection to download pictures, movies, music and games to their system. Granted, you can use the Media Go software and a computer. You can use the Playstation 3 and a cable. You can even use a Memory Stick Micro to put content on your PSPgo. But those are all safety nets. This device is meant for online purchases and play. A gamer's main access point for buying content is the Playstation Store, a built-in option on the PSPgo's cross media bar. Once set-up, gamers can use a credit card or store-purchased redeemable cards, to get new content. The store, available on the Playstation Portable as well, is a well constructed digital shopping center that makes finding and grabbing the content you want a breeze. Over the course of a week I purchased TV shows and games, rented a movie and downloaded demos from my home in the U.S., airports abroad and even the press room of the Tokyo Game Show. Getting content onto the device with a wireless connection from virtual anywhere was a breeze. And with five games, four demos, some music, pictures and a TV show and movie, I still had 9 of the 16 built-in gigs of memory free. Accessing the content is also a breeze, with a folder for system storage and another for the Memory stick. Within each folder are icons for the games already installed. The system of downloading, installing and playing full blown games is very similar to the iPhone, though the store is much better organized and the selection much more diverse and often of a higher quality than the iPhone's game section. Feel: My more-than hour long sessions spent playing games on the PSPgo never ended in hand cramping, despite the device's smaller size. The portable has enough heft to keep it from feeling like a toy, but it's light enough to minimalize any hand fatigue. The back of the features two slightly raised ridges which make clutching the go with your fingertips a bit easier while your thumbs dance across the front of the system. The directional pad and face buttons aren't as raised and don't have as much give as the ones found on the PSP 3000, but that's something I adapted to fairly quickly. While the single analog stick is shifted over a bit, now down and to the right instead of below the d-pad, I got used to that quickly as well. The big issue will be with games that require gamers to switch quickly between that right d-pad and the thumbstick. The new location for the two will make that much harder to do. 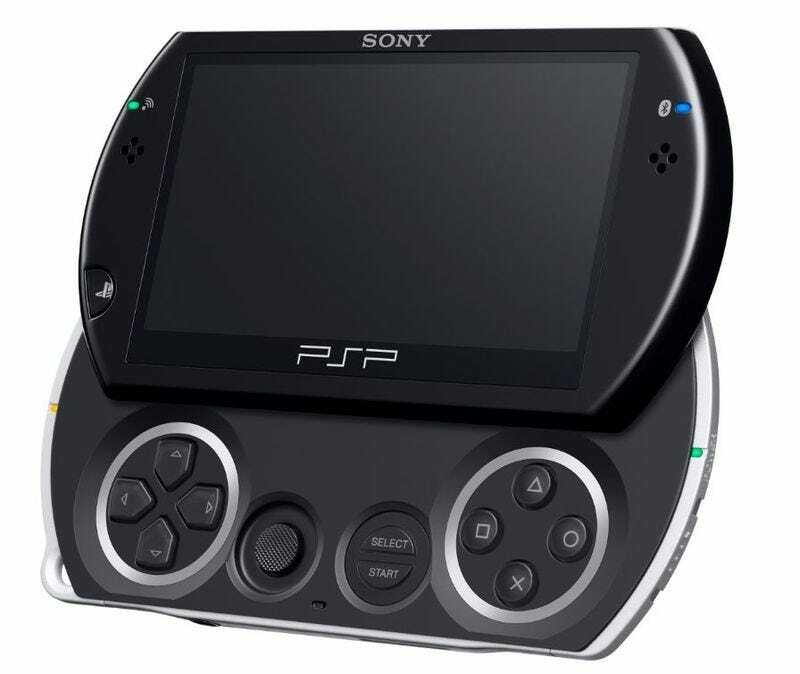 The shoulder buttons were far less clicky sounding and feeling than with the original Playstation Portable, but I felt that was a change for the better, not the worse. The button changes that did bother me a bit were the Select, Start, Display and Volume buttons. All four have almost zero give when pressed. The volume buttons, tucked away behind the screen on the top edge of the system, were hard to find and use during play. Overall, I found that for longer gaming sessions the PSPgo was a more comfortable system than the Playstation Portable. I do have relatively small hands, and thin fingers, so people with over-sized mitts may feel differently. Look: Much sleeker than the Playstation Portable and both the DS and DSi, it is perhaps more apt to compare the go to the form factor of the iPhone. While the iPhone, unsheathed from any case, is about half as thick, both devices are roughly the same size. Both slip in a pants pocket almost unnoticed. In fact, I spent much of the Tokyo Game Show walking around with both my iPhone and PSPgo stacked in one pocket. The PSPgo pops open to reveal a compact set of controls, but not too compact. While the screen is slightly smaller than the PSP 3000's (3.8 inches compared to 4.3) it wasn't something that stuck out to me. The only thing that I wasn't happy with was that the back of the screen reveals unfinished steel and a barcode when popped open to play games. The rest of the device is impressively slick. Game Pause: During the course of any game you can bring up an option to permanently pause the title. This creates a save point exactly where you paused the game and allows you to turn off the system, watch movies and even play another game, without losing your place. SIXAXIS Support: Using the PSPgo's built-in Bluetooth support, gamers can connect their Playstation 3 controller to the portable for full control in and out of all media and games on the system. While this may not seem very useful when on the go, it's a fantastic addition for those who plan to connect the device to their television when at home or to use the charging dock on their desk. Bluetooth Support: The PSPgo's Bluetooth support means you can use wireless headphones, speaker systems and, yes, even the Playstation 3 controller with your portable. Media Go: This software suite works with both the PSP and PSPgo, but it's a nice addition to a digital-only platform. Connecting your go to a computer with this software allows you to find movies, images and even your iTunes music to move to your PSPgo. You can also use the software to shop in the Playstation Store. Compatibility: Almost nothing on your Playstation Portable will work with your PSPgo. That includes television cables, GPS, camera, TV adapter and of course your library of UMD discs. There is a hardware solution to get some of that to work, but it doesn't look very elegant. The biggest let down of the system, and the biggest hindrance for those considering an upgrade from a Playstation Portable to the PSPgo, is the complete lack of support for getting all of those UMD games over to the new platform. While Sony initially said they were working hard to have a solution in place by launch, they recently told Kotaku that legal and technical issues prevented that from happening. They also seemed to indicate it may never happen. While I understand there are a lot of obstacles to overcome in allowing gamers to transfer a physical disc to a digital-only platform, not doing so makes the PSPgo a very hard sell to current PSP owners. The PSPgo isn't not backwards compatible, it's not current game compatible for those nearly 60 million PSP owners considering an upgrade. Price: At $250, the PSPgo is asking for a lot of cash for little more than aesthetic changes. The PSPgo's pure-digital approach to gaming is a big plus, but with Sony set to essentially cut retailers out of the game-selling formula, you'd think they'd be willing to subsidize the cost of doing that a little bit. The Little Things: There are a lot of things going for the PSPgo, but there are also a few annoyances. The system, like the PSP and the DSi, is still virtually unplayable in direct bright sunlight: A big let down for a portable device. The battery life is about the same as for the PSP and now, because the battery is stowed away inside the case beyond warranty-breaking seals, there's little chance you'll be able to buy an extended battery for it. It shouldn't come as a surprise that Sony also decided to change the memory stick type used in the PSPgo, opting for the smaller Memory Stick Micro, which means time to buy all new memory again. The good news is that you can get a 4GB one for as little as $12, though a 16GB one will run you $80. The PSPgo, with an eye-popping redesign and no need for a UMD drive, is the sort of system I would love to see replace the current generation of Playstation Portables, but until Sony comes up with some system to transfer over all of those purchased UMD games I can't see current owners giving up their platform. The cost, both for the system and in terms of repurchasing games, is just too high. For someone new to the Playstation Portable or even new to portable gaming, the PSPgo is an attractive option. With a price drop I could see the system flying off of shelves. The smaller, slicker design of the PSPgo is much more attractive and portable than the PSP and the promise of all future games landing digitally on the go is sure to eventually fuel the success of this portable. If you're thinking of upgrading from PSP to PSPgo and have a lot of games, I'd say hold off. If you're new to the platform and don't mind the price, than definitely pick one up. The PSPgo was designed by Sony Computer Entertainment and released on Oct. 1. Retails for $249.99 USD. Downloaded and played several games for more than a week, watched TV shows and movies, listened to music and looked at pictures. .